Washington County Sheriff’s Office DFC Charles Enders and his wife, Tina Enders, of Hagerstown, recently made a $50,000 donation to the Hagerstown Community College Foundation, in memory of Charles’s brother, Sgt. Richard H. Good, who died suddenly, July 16, at his home. He was 68 years old. Good retired from the Washington County Sheriff’s Office in 1996 with the rank of sergeant. After that, he worked as an investigator for the State of Maryland and most recently as a Circuit Court bailiff for The Honorable Judge Mark Boyer of Washington County Maryland. Both Sgt. Good and his brother, DFC Enders, earned associate degrees in administration of justice from HCC. Good was also a graduate of the FBI National Academy. The Sgt. 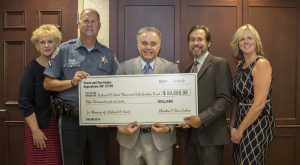 Richard H. Good scholarship will be awarded each year to two HCC administration of justice majors who aim to be police officers, are residents of Maryland, attend full time, and maintain a 3.0 grade point average. A named endowed scholarship given to HCC is held in trust by the HCC Foundation, Inc., and the interest from that gift is awarded annually to HCC students to help cover their tuition needs. The Richard H. Good Scholarship will remain in trust for perpetuity and will be a living legacy to Sgt. Good that will benefit generations of future HCC students. For more information on the scholarship, contact the HCC College Advancement Office at 240-500-2348. Photo caption: Pictured, from left, are Lisa Stewart, HCC coordinator of alumni relations; Charles Enders; HCC President Guy Altieri; Andrew Kramer, HCC assistant professor of administration of justice; and Stacey Crawford, HCC executive director for college advancement.